H&T provides two different condensate polisher systems—sodium-cycle polishers for lower-pressure boilers and externally regenerated mixed-bed condensate polishers for high-pressure or super-critical boilers. 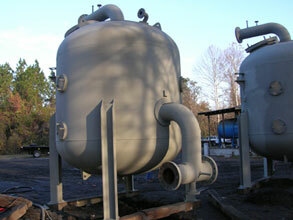 The objective is to filter any crud and exchange any trace contaminants picked up in the condensate loop. The externally regenerated mixed-bed polisher vessels are designed for the operating pressure and temperature of the condensate return line. To eliminate any possibility of contaminating the boiler, the ion exchange resin is sluiced out of the high-pressure polisher vessel and sent to a low-pressure regeneration system. Once the resin is backwashed, separated, regenerated and mixed, it is held in a storage vessel until it is sluiced back into one of the polisher vessels. Depending on specific requirements, anywhere from two to four regeneration vessels are used. In cases where off-site regeneration takes place, H&T can supply the high-pressure polisher vessels plus the spent and regenerated resin storage tanks. Condensate polishers operate at much higher flux rates than standard ion-exchange systems. Therefore, design of the internal distributors is critical for operating at elevated rates typical of a condensate polisher. Also, complete transfer of the ion-exchange resin bed has an impact on performance. It is important that more than 99% of the resin bed is transferred to and from the regeneration system. Sodium cycle polishers operate at elevated flux rates, and because they use only cation resin, higher temperature. However the operating pressures are typically 125 psi. Brine-regenerated cation resin is used in lieu of the acid- and caustic-regenerated cation as well as anion resin of the high-pressure mixed-bed systems. Resin is regenerated in the polisher vessels using a standard brine regeneration system. A small amount of a reducing agent like hydrosulfite can be added to the brine to help clean any crud and iron off the resin to prevent fouling. Sub-surface wash distributors are usually provided to allow for washing crud from the top of the resin bed without the need for a full regeneration.